Daguan Park is a very beautiful lakeside park on the lakefront of Dianchi Lake. It faces the Western Mountain that lying on the west of Kunming and only 3km from the downtown. 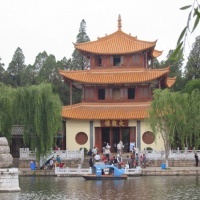 There is a very magnificent Pavilion - Daguan Pavilion (Daguanglou) standing in the park, thus it is named Daguan Park. 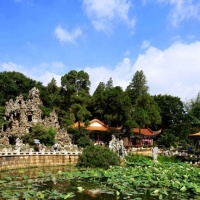 The park is renowned for its exuberant plants, grotesque rocks, temples, pavilions, small bridges, causeway and running water. More attractively, thousands of seagulls flock to the park in winter. They skim the lake water, circle overhead or flutter down with wings. The park is so beuatiful that it has attracted many people from all over the world inclduing Queen Elizabeth II and her husband The Prince Philip, Duke of Edinburgh. They visited this park in Oct. 17th 1986 and planted three British roses in the park. Daguanlou aka Daguan Pavilion. Daguan means "the grand view", and since the sightseers can enjoy a very grand view on the pavilion thus it gets the name. Located in the Daguang Park, Daguanlou was first built in 1828. It is a three-storied quaint timbered pavilionis. 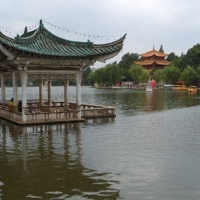 In front of the pavilion, a lake perches there,there are three pagodas in its water, which is an imitation of the Three Pools Mirroring the Moon of the West Lake, Hangzhou. Climb on the Daguanlou, you can view the spectacular Dianchi Lake and the picturesque Western Mountain. In addition to enjoying the beauty, you will find a miracle on the pavilion - the longgest couplet in the world.